So, it’s been about a month since I have visited the blogging world. In that month, many things have happened. Firstly, I have realized that among the millions of things my human brain processes per day, I only remember a few things, particularly lessons I have learned throughout the days, months, and years. Among those few things, I only write about the very special things that really stick with me or that I can’t NOT write about. In the past I have tried to stop going on Facebook except to post links to my blog, and unfortunately instead of avoiding Facebook and just posting on my blog, I wind up posting little tidbits of my everyday life onto my Facebook and completely ignore the more in depth posts I would have written on my blog (but they are all swimming in my brain somewhere.) In essence, I am committing to be off of Facebook until next January, in an effort to post more on my blog regardless of who/how many people read it. Why? Because Facebook basically destroys any normal person’s view of relationships, and sets up a fake standard for what your life is supposed to look like to the general public. Also, I waste copious amounts of time on it, and I can be more effective in life and spend more time with God and my friends that way. SO, because I have not been blogging as much as I would like to, whenever something pops up into my head that I want to write about I do something crazy… I write it down! Today, I am going to collectively discuss all the things I have written down over the past few weeks in order to “catch up” with myself. Twitter is a social media tool that prevents people from experiencing everyday life because they are too busy posting EVERY WAKING MOMENT in increments of 140 characters. I was a victim of this “tool”. I literally wrote down my every thought on Twitter. Something I am sure all of you have heard is that when you write something down, it helps you remember it. This is a terrible thing to do with every single thought that goes through your head, and you can guess why; it was self destructive, plain and simple. On top of that, as a believer, it took away my communication with God and replaced it with a desperate cry for attention from the 12 followers that maybe read my subtweets about them. The funniest thing about Twitter is that no matter how many retweets or favorites you get, you are just as alone as you would have been without them. Being away from Twitter for almost a year has enriched my prayer life abundantly, and I am so grateful for that. Long story short, sharing your thoughts with God in the form of a conversational prayer is much more beneficial than sending a tweet and worrying about whether or not somebody saw it or if it made sense. The God of the universe knows all, understands all, and can do all. Twitter is a silly website that will be obsolete in ten years just like Myspace, and all the time wasted on there will be flushed down the giant social media toilet. About 4 weeks ago, I was stung by a scorpion. This was one of the worst experiences of my life. Although the initial pain was small, just like getting a thorn stuck in my finger, the long term pain was staggering. Basically it was like a broken heart. Initially, the pain is small and a little bit familiar, and then it hits you and drags on for a long time. This is how it happened: At Rebekah’s 21st birthday party, we all played a game called fugitive. This is a glorified version of hide and seek that adults play in the city using cars or bicycles. My friend Grace and I teamed up to run and hide from the cars and reach the end point before they could- but we got trapped in an alley full of thorns and bushes. Thinking there was an outlet, we braved the bushes and thorns, pushing through until we reached what would be a glorious end. Unfortunately, there was a wall at the other side of all the trees and bushes. It happened to be pitch black, and at a certain point I was struggling for balance so I leaned up against a wall to my right using my right hand. Immediately a scorpion stung my ring finger, and I pulled my hand away as Grace shone her phone’s flashlight on the wall, illuminating the little wretched creature. After it happened, we made it out of the alleyway and finished out the night, then called poison control to make sure I was okay. After they told me I was okay, I did some googling about scorpion stings. Among the normal symptoms, muscle spasms were listed. So all at once, my finger was numb, on fire, feeling electrocuted, and my entire body was spasming and twitching. Overall, it was ruthless. After much research, I discovered that scorpion venom is a neurotoxin, which attacks the nervous system. All the nerves in my finger were destroyed, and every touch and bump against my finger caused shooting pain up my arm that felt like electrocution. At the same time, the skin on my finger was numb and I could have sliced it open with a knife and not even felt the blood dripping out. The point I am getting to is that my pain tolerance is really high, but my tolerance for numbness and not feeling anything is nonexistent. I would rather have broken my finger than had it stung by a scorpion, because I can handle the pain. What I can not handle is not feeling my finger, feeling the flesh that has been on my bones for almost 20 years. I also realized that I had been numbing the pain of a recent emotional hurt, and it was doing more damage than I thought, even though I could not understand it. I decided that even though there was nothing I could do about the numbness of the scorpion, there was something I could do about my emotional numbness. 4 weeks later, my finger is still numb, but my heart isn’t, and that is incredibly important. It is in pain, but the pain gets worse before it gets better, in many cases. Alligators and car accidents.. these two happened together, all in one day. I work at Whole Foods Market Chandler, and we are currently trying to raise money for an organization called the Whole Planet Foundation, which funds microloans for small businesses that are starting up. Today, we had a huge cookout event which sold hamburgers and hot dogs, a clown who was painting faces, the herpetological society and other various vendors who offered to contribute earnings to the charity. 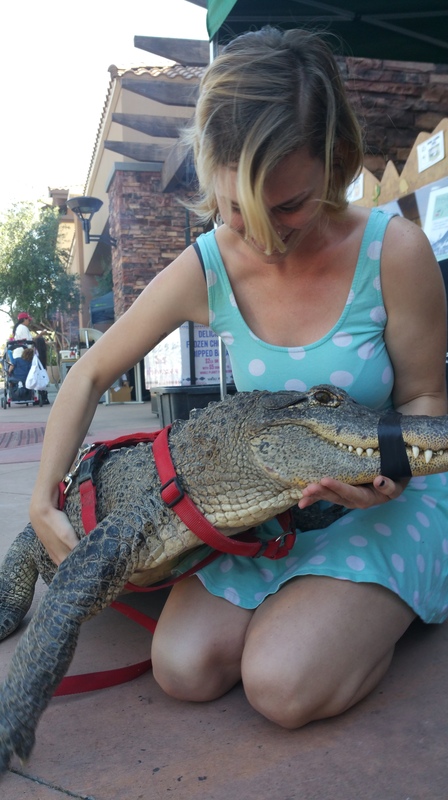 The Herpetological society had a live alligator outside, so I decided to go see it/pet it/hopefully take a photo with it. I asked someone near to take a photo of me with it, and then the guy running the booth asked if I wanted a better photo than just sitting next to it. 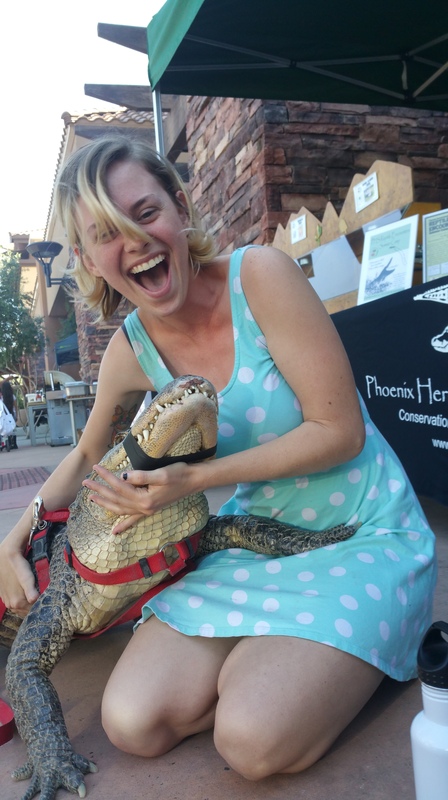 He then picked up the reptile, named “baby”, and placed her on my lap. She then proceeded to bite my leg off and I am sitting in the ICU as I type this. Shortly after my alligator encounter, I left work to go home for the day, and on the way home I noticed a giant spider web on my side mirror. I opened my car window to wipe away the webs, and as I was wiping them away, my tire blew out, sending my car swerving into a curb, and almost into a telephone pole. As I was trying to get control of the reeling car, I kept yelling out loud to myself, YOU ARE OKAY, IT IS GOING TO BE OKAY. Eventually, I got hold of the car and pulled off into a side street, freaking out a little bit. I called my brother, and got out of the car to assess the damage. My left front tire was destroyed, and my right rear view mirror was halfway torn off of my car. My first thought was relief that it was basically only my tire that got ruined on my car, and then my thought was, “Wow, a tiny spiders’ web got me looking off the road for half a second and if I had been paying more attention, I would have been able to better control the swerve.” Another thought was, “If I was two more inches to the right, I would have hit that telephone pole and probably rolled my car”. With shaky hands, I began to think of how thankful I was that I didn’t flip my car and end up in the emergency room. I also thought how such a small thing can throw you off course, and how in an instant your life can just be destroyed. Basically, I am grateful for life itself and to be alive still today even after my “accident”.